Solucide is an EPA registered hospital strenght hard surface cleaner, disinfectant, deodorizer and mildew stat. It is a broad-spectrum disinfectant spray that is effective in the presence of organic soil (5% blood serum). Solucide does not contain the suspected carcinogen ortho-phenylphenol or any other phenolic compounds. It is effective against pseudomonas and is tuberculocidal in 10 minutes at room temperature (22°C). 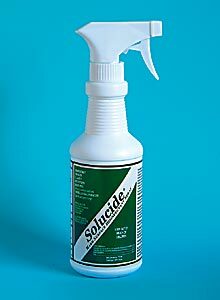 Solucide contains no alcohol or glutaraldehyde and has a fresh lemon scent.